The Chinese Film Forum UK is a network based in Manchester, UK that exists for the research and promotion of transnational Chinese film. It organises regular film screenings at the Cornerhouse in Manchester, and in early April there are some silent films: Piccadilly (GB 1929), staring Ann May Wong (5 April); a talk, ‘Beyond Dragon Ladies and Butterflies: Anna May Wong’s Stardom’, given by Mina Suder (5 April); and The Curse of Quon Gwon (US 1916-17), the earliest known example of Chinese-American filmmaking, shown as a double bill with the documentary Hollywood Chinese (US 2008), which looks at the ways the Chinese have been imagined in Hollywood movies, from silents to contemporary cinema (12 April). Read more. We must be grateful for our silents where we can find them, and sometimes they turn up on the extras rather than as the main attraction. 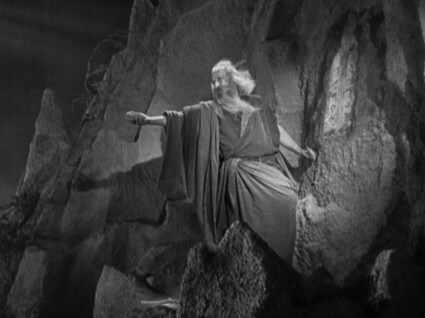 So it is that Paramount’s six-disc (count’ em) limited edition Blu-Ray release of Cecil B. de Mille’s The Ten Commandments (1956) includes his 1923 The Ten Commandments, with extras all of its own – audio commentary, hand-tinted footage and a two-strip Technicolor sequence. Read more. The Bioscope somewhat jumped the gun when we announced that the Thanhouser collection of films was appearing online (via Vimeo), but now the news is official, and you can find a list of all the films, with supporting information (and an invitation to help support their online access with PayPal donations) on the Thanhouser site. Read more. London Rediscovered is a one-day event on programming and presenting archive films of London, from silents to today, with talks by Patrick Russell (Curator of non-fiction at the BFI), Luke McKernan (a mere blogger), filmmaker Ron Peck, London Screen Archives’ Angela English, and Ian Christie, director of the London Screen Study Collection, curator and film historian. It takes place 29 March at Birkbeck College. Read more. Who will be the last person living who was a silent film performer? Mickey Rooney, who appeared in ‘Mickey McGuire’ silent comedy shorts from 1927, is still with us, but the way she’s going it could well be the indefatigable Diana Serra Cary, who made her first film at the age of two in 1921, under the name Baby Peggy. The Los Angeles Times has an illuminating interview with her, which concludes with the family tragedy that followed when her fame slipped away. “I could never be important to my father again after I became ‘me. '” Read more.